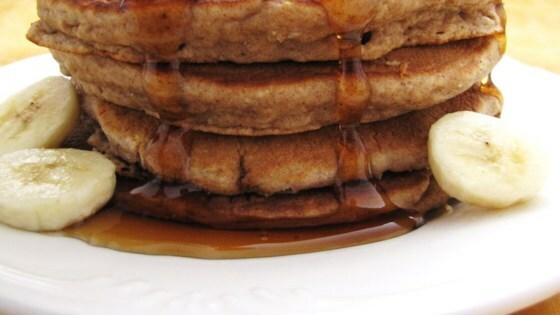 "A basic whole-grain pancake to get you going in the morning. We also like to change it up a bit by adding 1/2 cup applesauce and 1 1/2 teaspoons of cinnamon instead of the banana." These turned out really well. I used three ripe bananas, used less milk (less than a cup), and they were moist and yummy. I also added a tsp of cinnamon and a 1/4 nutmeg.